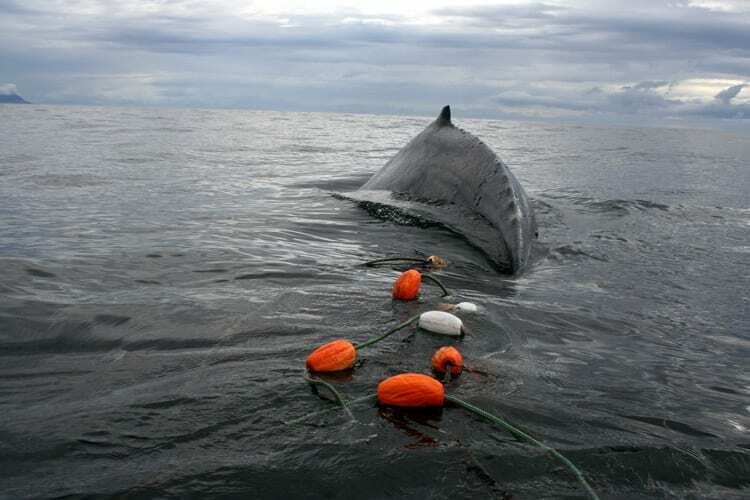 Moore cites scientific literature, necropsy reports, and individual case studies in an editorial essay addressing the ethics of whale entanglement and commercial whaling published in ICES Journal of Marine Science. 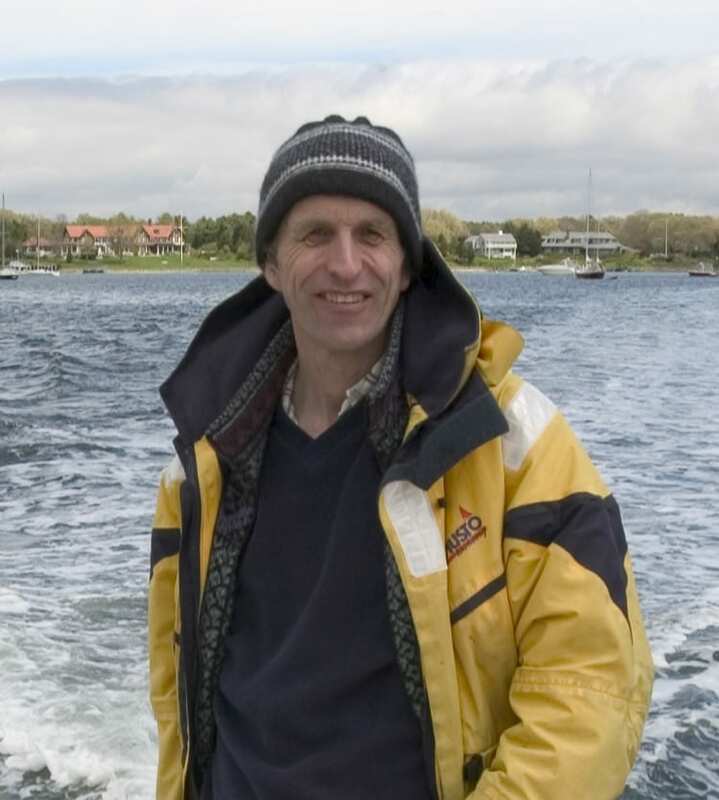 Moore, a veterinarian and the Director of the WHOI Marine Mammal Center, has studied large whale mortality throughout his career, first as an observer for the International Whaling Commission on an Icelandic whaling vessel and currently, as one of the few experts called to respond to whale strandings and entanglements along the East Coast of the U.S. He has responded to and performed necropsies on numerous large stranded whales. Many of these animals had died from months of starvation and fatigue after being entangled in rope, line, and nets from fishing and lobster gear. “I’ve spent over 15 years examining these animals and feel pretty frustrated in terms of the fact that our consumption of seafood is driving these cases to exist,” said Moore. He was motivated to write this editorial to inform the public about the impact of both commercial whaling and commercial fishing practices on the survival and welfare of whales. “I feel burdened by the knowledge I’ve gained about the suffering of these animals such that I don’t feel I can walk away without trying to prevent it,” he said. “The threat of commercial whaling is widely known, but many thousands of whales, dolphins, and porpoises die each year through unintentional entanglement in commercial fishing gear,” said Sharon B. Young, Marine Issues Field Director for the Humane Society of the U.S. Although large whales are powerful enough to break away from anchored fishing gear, they often swim off with residual gear wrapped around their appendages, which adds substantial drag inhibiting their ability to dive and forage. Being entangled slowly drains their energy to swim and fight infections. If not disentangled, the animal ultimately dies. “We’ve seen through our stranding response the devastating effects of entanglement on these animals. The chronic nature of entanglement leads to a long, slow, and painful death. It’s important to make this part of our discussion about the conservation of these species,” said Katie Moore, Director of Animal Rescue for the International Fund for Animal Welfare (IFAW). “We have a responsibility to the species we chose to protect when the Marine Mammal Protection Act and Endangered Species Act were enacted in the early 1970s. We need to do a better job of minimizing and ultimately eliminating opportunities for entanglement. There are only winners in this scenario: no whales die, fishermen don’t lose their gear, and research efforts can be focused elsewhere,” said Robert Rocha, Science Director for the New Bedford Whaling Museum. “We’re hopeful that, as people are made aware of the suffering and death, more can be done to stop it,” said Sharon B. Young, Marine Issues Field Director for the Humane Society of the U.S.
One solution Michael Moore proposes is the creation of Marine Protected Areas where marine mammals are known to frequent. “As long as the whales are foraging in the same habitat where the fishermen are harvesting, there is the risk of a conflict between the gear and the whales. To the extent that’s practical and economical, the more we can actually separate the two activities in time and space, the lower the risk of entanglement will become,” he said. In his essay “How We All Kill Whales,” Moore shows us the view from his unique perspective as a former scientific observer of the commercial whaling industry and as a veterinarian. In the former role, his primary concern focused on the sustainability of the hunt and the efficacy of the explosive harpoon technology. In the latter role as a veterinarian responding to an entangled whale, the animal’s welfare is his primary concern. 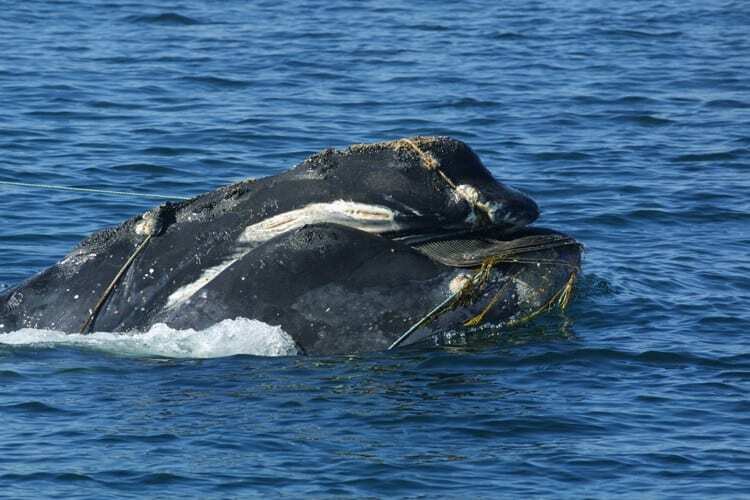 “Watching an entangled whale dying, ties my heart in knots. There’s no question about that,” he said. That’s why he is calling for more scrutiny of all whaling practices whether they are by design or by default. He also is presenting his findings to other stakeholders to raise public awareness and work towards solutions to this problem. For more information and to support this work, visit the WHOI Marine Mammal Center. Large whales break away from anchored fishing gear, but often swim off with residual gear wrapped around their appendages, which adds substantial drag inhibiting their ability to dive and forage. Being entangled slowly drains their energy to swim and fight infections. If not disentangled, the animal ultimately dies.